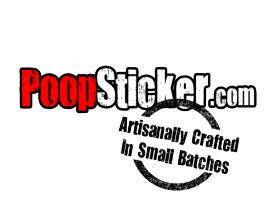 Poopsticker.com - Let us know what you think. 1. A sticker of poop . 2. A liitle gross and a lot funny. 3. The best way to leave a lasting impression. We love your comments. We just can't get enough feedback. Tell us about your best Poop Sticker stories or just let us know what you think. Get Your Poop Sticker On!